Couples often get so overwhelmed by the details of planning the wedding that they don't enjoy it by the time it comes. The planning process can become stressful for many, involving family dynamics and trying to make everyone happy. With so much stress, couples often forget WHY they are planning a wedding in the first place. This is a HAPPY occasion. The planning should not be stressful. This is a day you always want to remember, so don't let it be full of negativity and stress. Remember WHY you are getting married, and enjoy every part of the process of planning your wedding. Keep your priority on each other. Couples often think that hiring a wedding planner is too expensive or something they don't need. They think their moms or aunts or special friend will be able to handle the details of the day. I believe their family and friends should enjoy the celebration as well, and let someone else handle the details. Wedding planners can often save couples money, and can make your wedding run so smoothly that you are not even aware of any hiccups behind the scenes. It's your BIG day! You want to celebrate it — let someone else stress about the details! Enjoy it! Keep your priorities straight. Don't get upset if every detail does not go as planned. At the end of the day, if you still got married, that is what counts. That is what will last. And hire a GREAT photographer! Those memories will mean the world to you years from now! 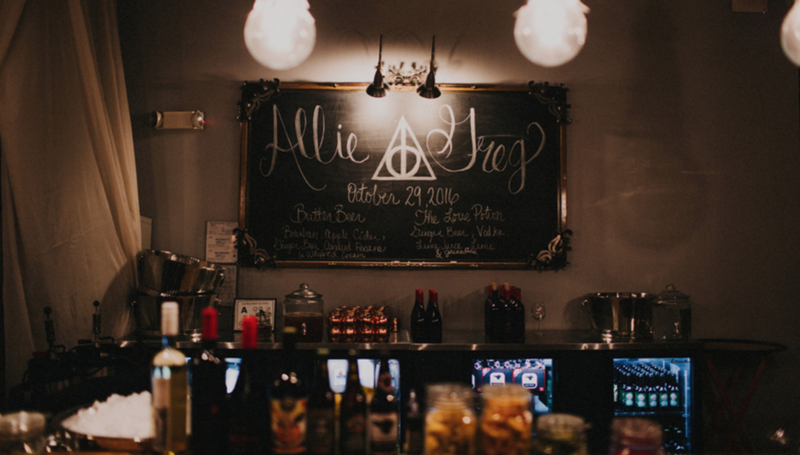 A Harry Potter Themed wedding. We made the venue look like The Great Hall, with floating candles hanging from the ceiling, long tables with brass and copper candlesticks lining the center. The rabbi and the band members wore scarves of the various houses of Hogwarts. Specialty cocktails included love potion and Butterbeer in copper mugs. Guests found their wands with names attached to find their table assignments, and well wishes were thrown into a goblet of fire. It was definitely one of a kind. There are a few to consider for "most" memorable, but one of my favorites included a reception that took an industrial venue and turned it into a warm, welcoming space, as if they bride and groom invited everyone over to their house for dinner. Mix-matched blue china place settings adorned long farm tables. Vintage lounge furniture was tucked in corners for casual conversations. Soft candle light and warm market lights kept the mood inviting and cozy. Dinner was followed by the most amazing dance party, including fun props for guests to play and dress up in. Krispy Kreme donuts and homemade cookies were served in lieu of traditional cake. It was a "close-knit" party for 200 guests.